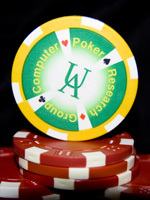 For the second year in a row, Polaris will take on some of the world&apos;s best poker players. This time, the stakes are raised even higher. Polaris will be pitted against some of the biggest names in the online poker world: Nick "stoxtrader" Grudzien, Matt "Hoss_TBF" Hawrilenko, and IJay "doughnutz" Palansky. The match will take place in the stoxpoker.com booth at the 2008 Gaming Life Expo in Las Vegas, July 3-6. More details about the match will be released in the coming weeks on this page and on the Stoxpoker.com man machine webpage. July 10, 2008 - Some of the results press coverage was added to the Press page. Also, you can read a prematch interview with Matt "Hoss_TBF" Hawrilenko at 2+2. Also, Nick and Bryce appeared on the 2+2 pokercast. Click here to listen. July 6, 2008 - Polaris completes the come-from-behind victory by posting a decisive win against Matt Hawrilenko and IJay Palansky. Polaris won both sides of the duplicate match to win convincingly! July 5, 2008 - The third session is over! In this match the luck was very lopsided, so even though Mark Newhouse was up over $250K, IJay lost $307K. This means that Polaris posted its first live victory with a record of 2-2-1. This sets the stage for the final live match tomorrow with Hoss_TBF and IJay. July 4, 2008 - The second session did not go Polaris&apos; way, with Rich McRoberts riding a huge upswing with aggressive play, and Victor Acosta playing good defense on the corresponding downswing to count human-kind&apos;s second victory in this match. This puts Polaris&apos; record at 1-2-1 with two matches to go. July 3, 2008 - The result from the first live match is in! Nick "Stoxtrader" Grudzien and Kyle "cottonseed" Hendon managed to draw with Polaris. Hand histories and more will be up soon. July 1, 2008 - The Results page has been added to show the results of the remote matches so far. The first live match is just two days away! June 30, 2008 - Articles in Science News and the Edmonton Journal were added to the Press page. In addition, two remote matches have been played by two sets of human teams. The results give Polaris a record of 1-1 (one win and one loss) going into the Vegas live matches. Hand histories and results will be added very soon. June 11, 2008 - The story of the upcoming match has started to break on the internet. Articles on PokerNews and PokerPages have appeared talking about the match. Find them on the Press page. Some information about Polaris has been posted on the Competitors page. Bios of the confirmed players will be added in the near future. June 10, 2008 - Launched this website. More details about the competitors and the UofA CPRG will be added in the coming weeks.